Born 1971. Native of Halifax, Canada. Has spent seven years in Japan, entirely within the Kyoto area. Realizing a strong interest in Japanese traditional arts and culture, Peter has studied Japanese dance, brush painting, flower arrangement, and calligraphy. This interest has led him to come into regular contact with Kyoto's traditional artisans, especially geisha and geisha apprentices - maiko. And the ultimate contact when he married a former geisha. 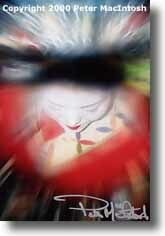 Always interested in photography, Peter has combined his talent using a camera with his appreciation of the classical beauty found in the geisha community. His kindness and sincerity as a photographer has been reciprocated by the subjects in his photos, and he is the only foreign man with such access to a world completely off-limits to most people - Japanese and foreigners alike. Based on the relationships Peter has developed with the members of this secretive group of traditional artists and entertainers, Peter now shares his privileged view - "Through Blue Eyes" - to appreciative audiences in Canada, the U.S. and around the world. The result is a unique glimpse into Kyoto's Hanamachi. 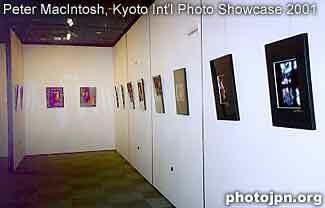 Peter had the largest wall space (14.4 meters or 47 ft) in the room and used it to show 12 photos of Kyoto's geisha (geiko) and maiko. Many of them were picture-postcard perfect. He personally knows many of the maiko in Kyoto, and has photographed them from several points of view: As a friend, as a customer, as a foreigner, and as a fellow artist. A few of the photos obviously required a close and trusting friendship. 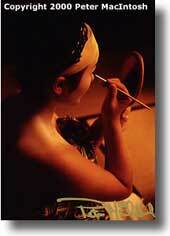 For example, the photos of a geiko putting on her make-up and other private moments. 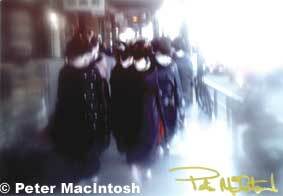 He was also a speaker at the slide show for which he dressed in a kimono.